At the General Legislature Meeting on Tuesday, March 7th, Suffolk County Leg. Sarah Anker and Presiding Officer DuWayne Gregory honored Vincent Cordiale of Rocky Point for earning the Legislature’s Employee Excellence Award. 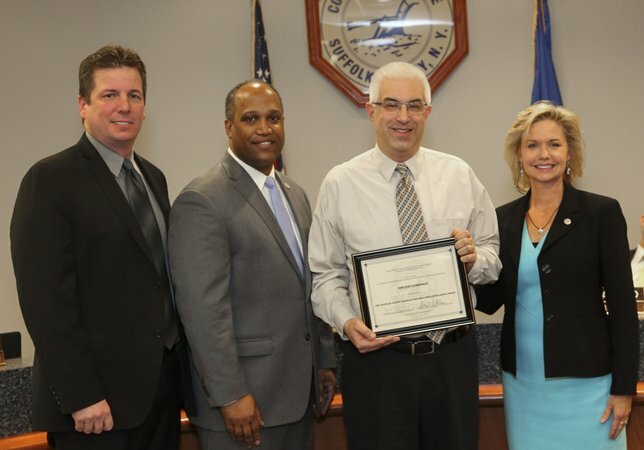 Vincent Cordiale of Rocky Point earns the Suffolk County Legislature’s Employee Excellence Award. Photo by: Office of Suffolk County Legislator Sarah Anker. Riverhead, NY - March 17, 2017 - At the General Legislature Meeting on Tuesday, March 7th, Suffolk County Legislator Sarah Anker and Presiding Officer DuWayne Gregory honored Vincent Cordiale of Rocky Point for earning the Suffolk County Legislature’s Employee Excellence Award. Mr. Cordiale is a Systems Analyst Supervisor for the Department of Information Technology. He has been an employee of the County for 20 years and is responsible for the County’s overall technological infrastructure. Subject: LongIsland.com - Your Name sent you Article details of "Legislature Honors Vincent Cordiale with Employee Excellence Award"